I've said it before a million times on this blog - I adore Makeup Geek eyeshadows - they are amongst my all time faves. For $6 or in and around €6 if you purchase from Beauty Bay, you get highly pigmented little pans of pigmented buttery goodness. If you're not familiar with the brand, Makeup Geek is the brainchild of Marlena Stell or Makeup Geek on Youtube and she launched her own cosmetics line off the back of her Youtube success back in 2012. Whilst the Makeup Geek range now includes blushes, contour powders, makeup brushes, highlighters, pigments, sparklers, eyeliners etc. (and soon to be launching lip products and foundations by all accounts! ), the eyeshadows are definitely the standout products. There is now a huge selection of eyeshadows available from Makeup Geek website - mattes to shimmers and foiled and duochrome lines. This post is just a quick look at the warm Makeup Geek eyeshadows in my own collection. My Makeup Geek warm eyeshadow Z palette is my most used eyeshadow palette at this time of year - as soon as the autumn rolls around, i just cannot get enough of the warm brown and burgundy shades. I got my Z Palette from Beauty Bay - this is the extra large one and it holds 35 Makeup Geek eyeshadows (which are the same size as MAC eyeshadow pans). It's usually around the €25 mark and there is no need to go faffing around with magnet stickers - the pans will just stick to the palette when you put them in. Voltage is part of the Duochrome collection and is described as a vanilla base with champagne-yellow reflects. This eyeshadow is not as smooth or pigmented as the regular line eyeshadows and it takes a significant amount of layering to build up the colour you see in the swatch above. Shimma Shimma is one of my favourite MUG eyeshadows of all time and I love putting this all over the lid with a matte shade in the crease or on the centre of my eyelids for a little bit of reflection. This is described as a metallic champagne shade and I think I am on the cusp on hitting pan on this one. Vanilla Bean is a peachy beige colour with a very slight shimmer and is perfect for brightening the eye and setting down a base for applying other eyeshadow products. It's brightening on my fair eyelids but not too stark. I'm Peachless is another shadow from the Duochrome collection and again, it's quite difficult to pick up and work with this product. You might notice a recurring theme here when it comes to the Duochrome eyeshadows. This is described as a buff base with peachy pink reflects. Beaches and Cream is one of my favourite transition colours for the crease as it's incredibly subtle. This is described as a creamy matte natural beige with just a hint of peach. Starry Eyed is from the Foiled eyeshadow collection which is not my favourite offering from Makeup Geek (read my full detailed review here) but out of all of the foiled eyeshadows I have, this one is my favourite. I adore this shade - it's like Shimma Shimma on steroids and is described as a light champagne beige with slight pink undertones and a foiled finish pinky-beige champagne. Peach Smoothie again is an absolutely heavenly transition colour for the crease. I sometimes wear this in my crease with a very neutral, natural colour on my lids as I feel like it just makes my blue eyes pop out of my head. The matte finish on this is probably the softest I have ever come across. Creme Brulee is an absolute necessity if you're interested in trying out some warm toned MUG eyeshadows as this eyeshadow is one of my top 10 eyeshadows in life, never mind from MUG. This is described as a medium sand colour with a soft matte finish and, believe me, this is soft and matte and beyond pigmented. Such a lovely texture to work with, absolutely zero fallout. I could honestly gush about this one for days. Glamorous is a gorgeous expensive looking shimmery bronze gold shade that looks amazing over the lid with any matte brown eyeshadow in the crease. It's shimmery enough to be statement but not chunky or glittery in the slightest. In the Spotlight is another foiled shadow and is described as a soft pink with coral undertones and a foiled finish. This is a gorgeous shade - no doubt about that - but the foiled formula is not my favourite. Frappe again is mid toned warm brown perfection in a little metal pan. This is described on the Makeup Geek website as a medium maple brown with a demi-matte finish and has tiny shimmer particles which are not noticeable when applied. Latte is a bog standard medium matte brown shade but one that I think is absoutely essential in any warm toned eyeshadow palette. It's darker than Frappe, slightly cooler but still very much a warm shade. Cocoa Bear is another one of the Makeup Geek eyeshadows that I think is an absolute must have. This might even be my number 1 eyeshadow from the entire MUG lineup - it really is exquisite - the shade is warm and rich - the fact that it is a pleasure to work with - the formula - if this was a pupil, then it would be the teacher's pet. This is described as a matte reddish brown. Desert Sands reminds me a lot of MAC Uninterrupted - the shade that everybody had to have a few years back. It's described as a medium camel brown with warm yellow undertones and a matte finish. Goddess is a pale metallic copper shade which, although not as pigmented as some of the other MUG eyeshadows, performs well enough when built up. Again, I think this is incredibly flattering on blue eyes. Cosmopolitan is a rose gold shade with gold flecks and a gorgeous shimmery finish and it looks absolutely incredible with Cocoa Bear blended in the crease. Roulette is described as a rosy, burnt sienna shade with a silky, shimmery finish - it's quite similar to Goddess on the eyelids and I do prefer this one so if you were to pick between the two, I would go for Roulette instead. 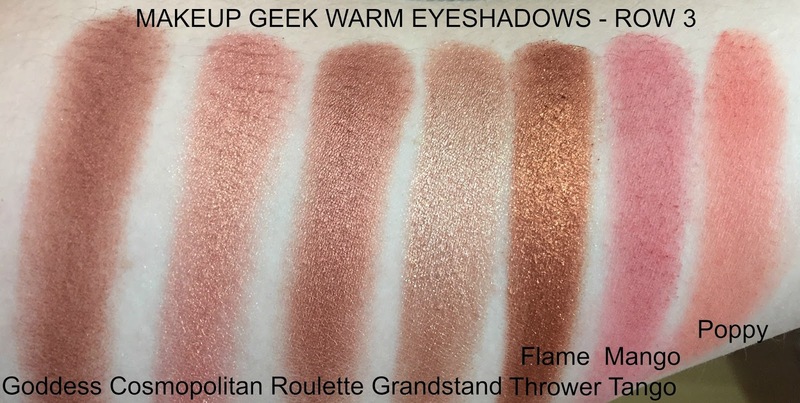 Grandstand is also from the foiled eyeshadow collection, which means that even though the colour looks amazing on the pan and absolutely stunning when swatched, it just does not last that long on the eyelids unfortunately. This is described as a medium rose gold with slight taupe undertones and a foiled finish. 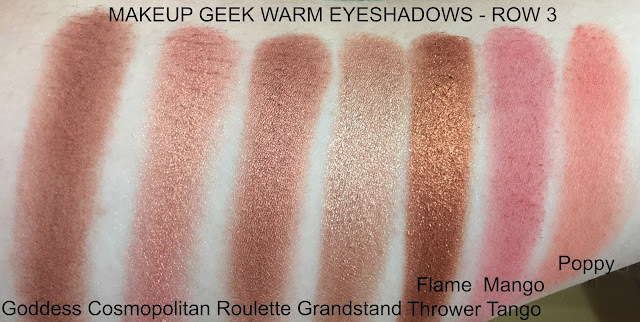 Flame Thrower is the one eyeshadow in this palette that your eye is completely drawn towards - in fact, when I posted a picture of this palette on my social media a few months back, all anybody asked me about was "that shade third from the right on the third row". This is from the foiled collection and is described as a true brightened warm copper with a foiled finish. Mango Tango is described as a peachy pink with flecks of gold. I'm not sure about the flecks of gold as I can't see them nit this is a gorgeous crease or transition shade with gold toned eyeshadows. It's a little more subtle than the burgundy shades in the next row. Poppy is the opposite of Mango Tango as it is most definitely a predominantly orange shade with slight pink undertones. I really don't think I use this shade enough and this exercise of swatching all of the shadows and comparing them with each other has made me aware that there are some gems in my collection that I'm not sharing enough love with. Cupcake is another one of my absolute favourite MUG eyeshadows - a gorgeous matte medium pink that looks incredible on the eyelids with warm or cool toned shades. It's quite a sophisticated shade of true pink I think - not Barbie or bubblegum but not salmon or orangey pink either. Anarchy is described as a medium marsala shade with a shimmery finish, and on first inspection, it looks like a shimmery version of Bitten or a Bitten/Roulette hybrid. I cannot wait to use this eyeshadow to its full potential in December when I typically embrace the cranberry and burgundy shades. It swatches beautifully. Wild West is described as a rich rose brown with a matte finish, deeper and redder than Latte. This for me, is very very similar to Cocoa Bear, perhaps slightly lighter and browner. It's a gorgeous matte shade. Bitten is described as an earthy maroon with a matte finish - which really could not be any more appropriate. It was this shade and the next shade Burlesque which made me less scared of red tones near my eyes - they are phenomenal. A little bit of Bitten in the outer V with a metallic gold or champange shade like Shimma Shimma and something like Cupcake or Cocoa Bear in the crease really is my signature warm eyeshadow look. Burlesque is described as a metallic muted burgundy with warm undertones - so it's a little darker and a little more shimmery than Bitten. I really use the two interchangeably so I don't have a favourite between the two of them. Cherry Cola is described as a deep brown with strong red undertones and a matte finish. I have to say, surprisingly, that this eyeshadow is quite poor in terms of pigmentation and ease of application. It took a couple of swatches to build up the intensity of the colours above whereas for most of the other matte shades, one single swipe was enough. I might have just gotten one from a bad batch but I have to say, this had much potential for greatness and just fell flat. Unexpected is quite an unusual colour - sometimes I feel like it is pink, sometimes grey, sometimes even light brown - it's one of those colours that just goes with a multitude of other colours and you can see in the picture of the pan above that I have made a pretty sizeable dent in it. It's described on the MUG website as a matte pale pink brown and it reminds me a lot of the MAC shade in Quarry. Vintage is another gorgeous shade and one that I have really been enjoying wearing in recent times - it's described as a medium brown with mauve undertones and a matte finish. It's a gorgeous colour in the crease and again, I just find this works so well with warm or cool toned shadows. It's unusual but it's become a favourite of mine. Homecoming is described on the MUG website as an earthy buckskin colour, or a medium brown with gold shimmer to you or I. This looks incredible with some of the red browns like Cocoa Bear and Wild West and the burgundies like Bitten and Burlesque. It's nicely pigmented with no fallout and lasts well over primed eyelids. Taupe Notch is described simply as taupe - no further explanation necessary. If you are a neutral eyeshadow lover, I really feel like this is an essential shade - in the pan and swatched it doesn't look like much but when paired with other eyeshadows, it really is special. It looks great with the warmer tones, with purple and even with a smoky eye. Pretentious is a gorgeous warm metallic bronze shade - more antique bronze than Homecoming or Glamorous. Mocha is a described as a deep matte neutral toned brown eyeshadow but it's not as deep as I would like it to be (think MAC Mystery deep). I think it this was more pigmented, it would pack more of a punch, but truthfully this eyeshadow takes a little bit too much work for my liking. Americano is described as a dark brown with subtle purple undertones, and again, rather unfortunately, it applies patchily and takes a bit of work but once it is applied and blended, it looks great and lasts well. That's the blow by blow account of each of the colours in my warm eyeshadow palette, and if it's not clear already, I might do another post in the not too distant future on my top 10 Makeup Geek eyeshadows, my favourite Makeup Geek eyeshadow combinations or my cool toned Makeup Geek eyeshadow collection (let me know in the comments below if this interests you). The thing with these eyeshadows is that for the most part, they are incredible quality, and they are are still cheaper than MAC who recently reduced the price of their single pan eyeshadows to $6/€7 a piece. In general, the eyeshadows from their regular line last well, I've applied them first thing in the morning and they are still decent in the evening when I go to take off my makeup, and I've already expressed my disappointment with the foiled and duochrome eyeshadows. I'm a huge fan of Makeup Geek as might be evident from this here blog and I will definitely continue adding to my collection, particularly when we can now get Makeup Geek so easily on this side of the Atlantic thanks to Beauty Bay. 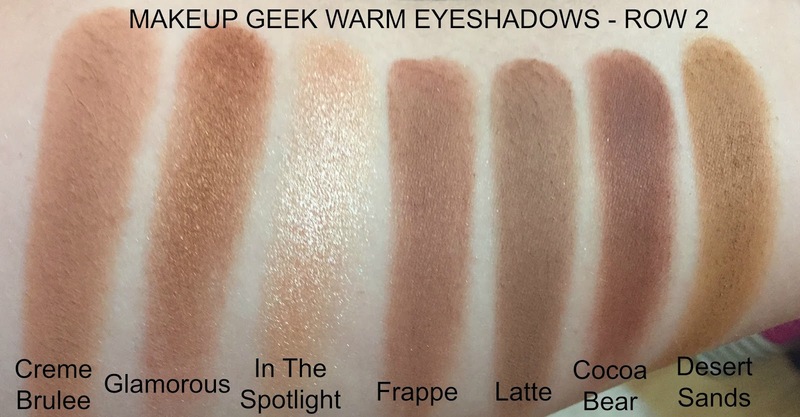 I would love to hear of any Makeup Geek shade or combination recommendations in the comments below. Was there any shades in particular that tickled your fancy? Your eyeshadows are SO beautiful, can't believe I haven't tried anything from them!! I bought curtain call from the new range and it's such a nice shadow! I'd love to see a post about some combos for inspiration and also would love to hear your thoughts on the cool toned options too!